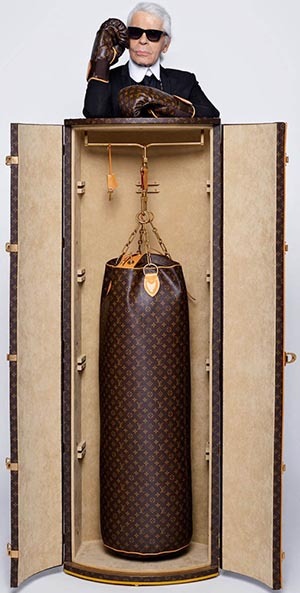 BOXING is a combat sport in which two people engage in a contest of strength, speed, reflexes, endurance, and will, by throwing punches with gloved hands against each other. Amateur boxing is both an Olympic and Commonwealth sport and is a common fixture in most international games—it also has its own World Championships. Boxing is supervised by a referee over a series of one- to three-minute intervals called rounds. The result is decided when an opponent is deemed incapable to continue by a referee, is disqualified for breaking a rule, resigns by throwing in a towel, or is pronounced the winner or loser based on the judges' scorecards at the end of the contest. 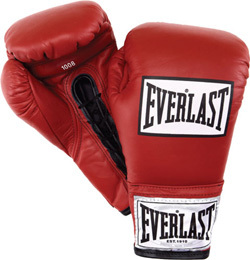 EVERLAST BOXING APPAREL - since 1910. BAD LEFT HOOK - "The Best in Global Boxing News and Commentary." 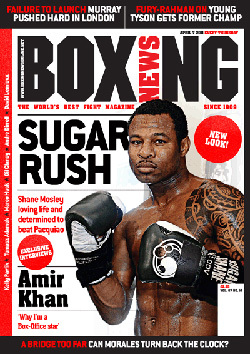 Boxing News - "The Worlds Best Fighting Magazine Since 1909." The longest-running boxing magazine still in publication, dating back to 1909. BOXING NEWS 24 - boxing news, views and interviews. BOXINGTALK - feature length boxing articles, interviews, and links. COMPUBOX - "Every Punch Counts." EAST SIDE BOXING - your source for 24 hour boxing coverage. FIGHTHYPE - boxing and mma interviews and breaking news. FIGHTNEWS.COM - latest boxing news. HBO BOXING - services are available in more than 50 countries and reach over 35 subscribers. LIVE FIGHT - live stream boxing, boxing news, boxing forum, watch online PPV, world rankings, boxing calendar. RINGSIDE REPORT - "The Heart Of Boxing." SHOWTIME BOXING - boxing events. SOSOBOXING - "Worlds Largest Boxing Video Site." THE RING MAGAZINE - since 1922. "The Bible of boxing." THE SWEET SCIENCE - Boxing news. "There is no shortage of websites to visit if you are a boxing fan. But there is only one website, TheSweetScience.com, to click on if you appreciate old-school writing craftsmanship while you get yourself up to date on the latest ring news." VIP ONLINE SPORTS BOX - "Sports On Demand Live. Sports Streams Online For Free." BOX REC - Boxing Records. BOXING Junkies - "The premier boxing website catering to enthusiasts, collectors and beginners alike. We offer the Largest selection of boxing dvd’s on the planet, and boast one of the hottest boxing forums in the industry." COMPUBOX - "30 Years and Counting." Computerized punches scoring system used in boxing matches across the world. Cross - in boxing, a cross (also commonly called a "straight") is a Power-Punch like the uppercut and hook. Compubox, a computerized punch scoring system, counts the cross as a Power-Punch. DBE | DIBELLA ENTERTAINMENT - boxing promotion. DICKY EKLUND - portrayed by Christian Bale in "The Fighter". DON KING PRODUCTIONS - DON KING- Wikipedia. GOLDEN BOY PROMOTIONS - Oscar De La Hoya's company. GOOSSEN TUTOR PROMOTIONS - boxing promotor. HBO World Championship Boxing - American sports television series, premiering in January 1973 that has shown a number of significant boxing events in the last three decades. HENNESSY SPORTS - Mick Hennessy Promotions - one of the UK's leading promoters. How to Take a Punch - The New York Times. Joe Frazier vs Muhammad Ali (1971) - Round 15 knockdown. KLISCHKO BROTHERS - official site. Lineal championship - in combat sports where champions are decided by a challenge, the lineal championship of a weight class is a world championship title held initially by an undisputed champion and subsequently by a fighter who defeats the reigning champion in a match at that weight class. In professional boxing, the lineal champion is informally called "the man who beat the man". LONDON PRIZE RING RULES (1743) - were introduced by heavyweight champion Jack Broughton in 1743 to protect fighters in the ring. MANNY "PACMAN" PACQUIA - official site. MARQUESS OF QUEENSBERRY RULES (1867) - a code of generally accepted rules in the sport of boxing. MICHAEL BUFFER - Mr. Ring Announcer: "Let's Get Ready to Rumble" - at the Internet Movie Database. Networth: US$400 mio. Michael Buffer has come through his own fight with throat cancer - Daily Mail. MIKKEL KESSLER - Danish Super Six participant. MMA | MIXED MARTIAL ARTS - get the latest MMA news, results, analysis and commentary with live coverage of all UFC, Strikeforce, WEC and other events. MUHAMMAD ALI - official site. Muhammad Ali Dies at 74: Titan of Boxing and the 20th Century - The New York Times. Muhammad Ali up close & personal from inside the boxing fraternity - The Guardian. Muhammad Ali's tangled love life leaves troubled legacy - The Telegraph. NIKOLAY VALUEV - "The Beast from the East". 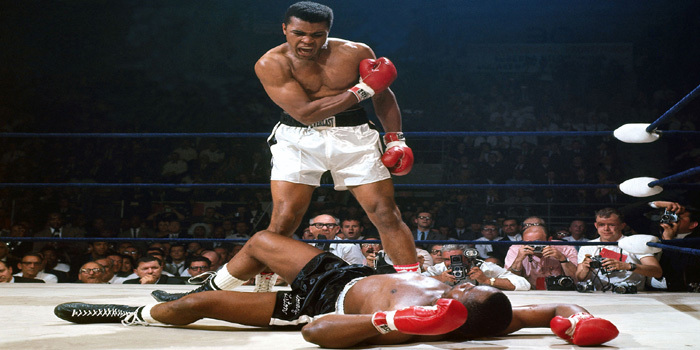 Phantom Punch - the punch that ended the second fight of Muhammad Ali versus Sonny Liston. Pound-for-pound rankings - Ring Magazine. RANDY "THE NATURAL" COUTURE - official website. SAUERLAND EVENT - Team Sauerland: German boxing promoters. The Last Man to Beat Floyd Mayweather Jr. Still Regrets It - The New York Times. TOP RANK BOXING - ROBERT "BOB" ARUM. UFC | ULTIMATE FIGHTING CHAMPIONSHIP - world's leading mixed martial arts sports association, formed in January, 2001.
undisputed championship - in professional boxing, the undisputed champion of a weight class is usually a boxer who is recognized as the world champion at that class by each boxing organization. Wars of the Ring - Anthony Joshua vs Wladimir Klitschko joins the list of greatest battles in boxing - The Telegraph. What I have learned from scoring 528 fights as a boxing judge - "Before I took up judging I thought I could score fights from TV footage or anywhere in the arena. I was wrong." What I've learned from talking to the world's great boxers - The Telegraph. What makes a heavyweight's punch so devastating? - The Telegraph. Wild Card Boxing Club - 1123 Vine St, Hollywood, Los Angeles, California 90038, U.S.A.